“I’ve got a bottle of Canadian Club in the room. Come on up and have a drink.”	Not exactly words you would automatically think of coming from Peter Pan or Maria von Trapp. But come they did, from Mary Martin. She had just received the first Richard Rodgers Award from the Pittsburgh Civic Light Opera, which had been celebrated at a fantastic garden party in one of Pittsburgh’s posh neighborhoods. I took a ride back to the hotel with the honoree, and that’s what she said to me as the car pulled up to the William Penn Hotel. The answer was simple – “Sure.” So up we went – Mary Martin, her assistant Susan Grushkin, and me. And out came the Canadian Club. Three things happened right away. First, she became real Texan. The drawl had obviously been replaced through the years by a middle-theater non-accent for the public, but once the spotlight was off, the girl from Weatherford came out. Second, while I wouldn’t say salty is the right word, certainly there was a loosening of the prim and proper. And third, she seemed somewhat out of touch with what was going on in the cultural landscape. She mentioned a book she had read in which she found a character appealing, one she might like to play if an adaptation could be created. The book was COLD SASSY TREE, the role was of a young woman, and a well publicized television version was on that very week. But then there was a time when stars didn’t necessarily have to be in touch. 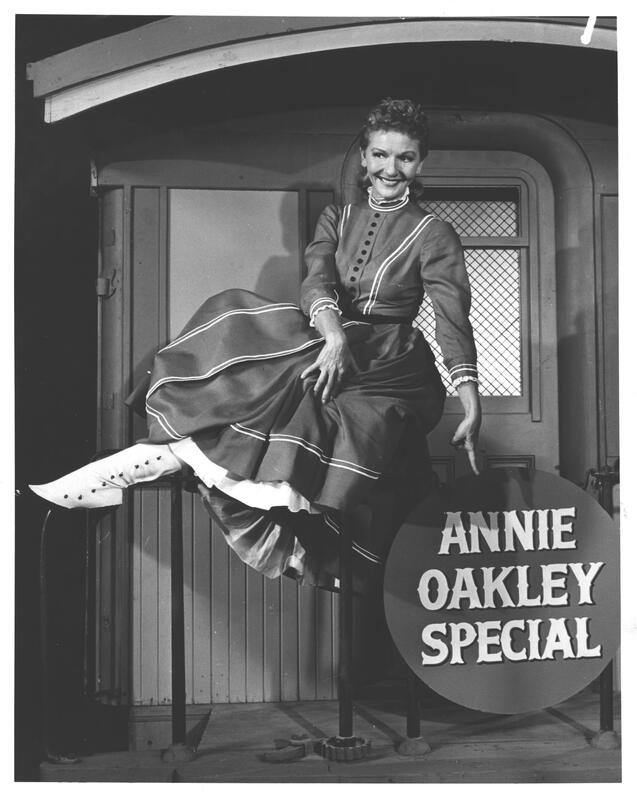 And when Mary Martin was a star, she was…a…star. Her husband Richard Halliday took care of her, and that meant doing just about everything, from escorting her to rehearsals or the theater, arranging for her meals, to doing her hair. He kept such a close eye on her, that one Christmas during the run of SOUTH PACIFIC, Dorothy Hammerstein bought a small table at Mary’s request as a gift for Richard. The only way Mary could see it to approve it was for Dorothy to bring it to the Majestic Theater during a matinee, stand off stage in the wings and show it to Mary when she came off stage between scenes. as concerned when a bona fide opera basso, Ezio Pinza, was hired to play opposite her. Because her voice was not that of a high soprano, she asked, “What on earth do you want, two basses?” She was reluctant to compete vocally with someone who could sing rings around her – and the negotiated middle ground was, and this holds to this very day, that the two leads only sing together for 29 bars, and it is at a time in the show when they are both relaxed, somewhat giddy, and just a little bit drunk. She triumphed in SOUTH PACIFIC, and she helped SOUTH PACIFIC triumph as well. 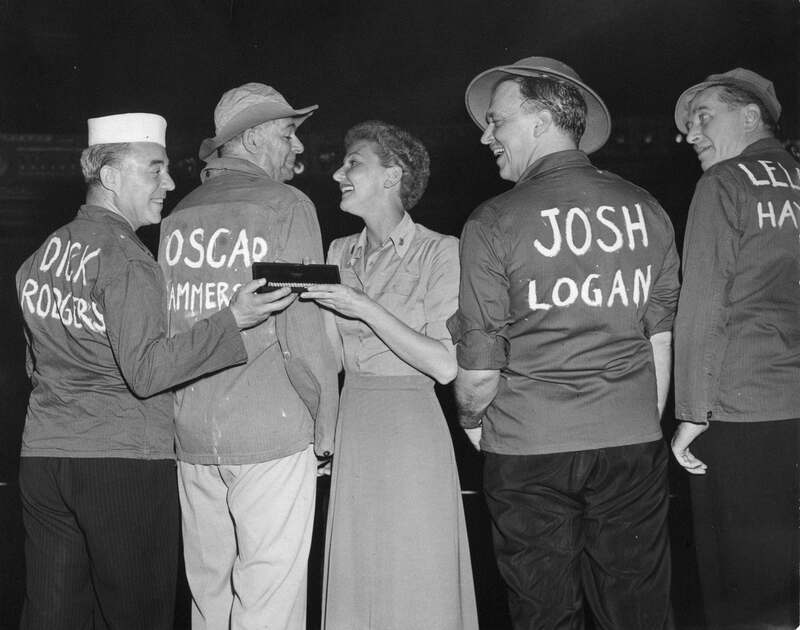 She played the show for two years, and on her final performance, at the curtain call, Rodgers, Hammerstein, director/co-author Joshua Logan and co-producer Leland Hayward walked out on stage dressed in fatigues – with their names painted on the back of their jackets. While we don’t know exactly what they said, the photographs of the event are remarkable. In a tin bucket they brought out with them was a diamond and pearl bracelet as a gift for their star. That tells you everything you need to know about the power of Mary Martin. 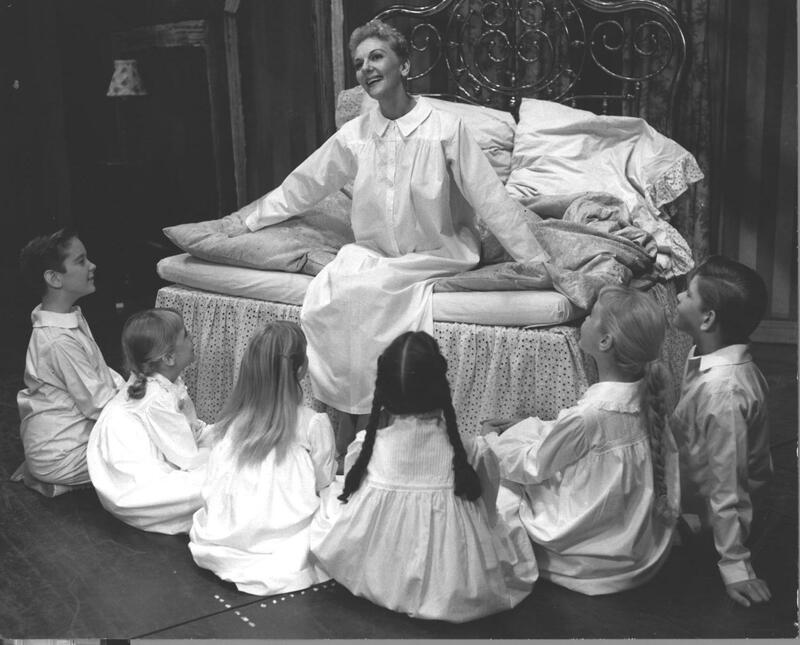 And it is always good to remember, especially in this, Mary Martin’s centennial year, that THE SOUND OF MUSIC began life as a Broadway vehicle for her, one of its biggest stars. Without her, there wouldn’t ever have been “raindrops on roses and whiskers on kittens,” and we’d all have had to figure out for ourselves that if you “climb every mountain,” you can find your dream.Family Singers would be used. 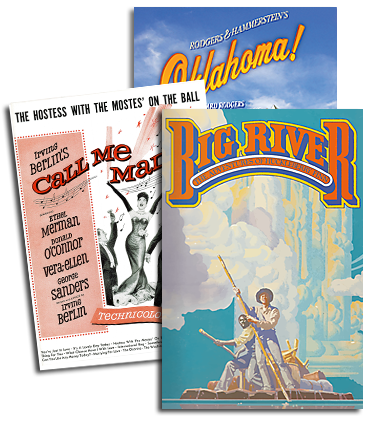 Leland Hayward and Richard Halliday had the idea to ask Rodgers & Hammerstein to provide a few new songs to go along with the madrigals, to make the play feel more modern to the 1958 audiences. Well, we know what happened – Rodgers & Hammerstein felt an entirely new score would be more appropriate, and said that if everyone could wait for them to finish FLOWER DRUM SONG, they would be happy to join the team of Lindsay & Crouse, who were writing the play, and craft a musical. The result was THE SOUND OF MUSIC.